Life in the Steam Age is a confusing web of restrictions, rules, mores, & manners. Modes, Manners and Related Topics from A-Zed, including Assignations, Duels, The Military, Traveling by Land, Sea & Air, Races & Regattas, and, of course, the Right Clubs and How to Keep Up Appearances. Proper applications of High Sorcery, including Cantrips, Wards, and New Lorebooks Recently discovered and Our Readers Most Frequently Asked Sorcerical Queries. How to hold a Proper Dinner, Ball, or Weekend at Your Country Estate, including Notes on Boar Hunting, Parlor Games and the Casual Liaison Between Consenting Adults. Where the Fast Set is during the Season, plus all the Most Important News and Gossip from 1869-1880, and a Timeline of Personages of the Age, so that You will Know When and Where to be Seen and with Whom. Alternate Rules & Clarifications of the Great Game, including a Freeform Alternative Gaming system, A Hard-Numbers Alternative Gaming System, and Guidelines for Live-action Steam Age Role-playing. Complete Victorian costuming on a budget for those of Modest Means, both Historical and Monetary. Plus: Nine New Skills & Abilities, Three New Roles, and Maps of the Most Important Places to be in 1870s New Europa. 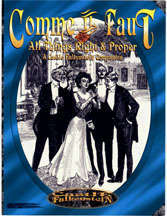 Comme Il Faut - Consider it to be a quality publication as useful and timely as your DeBrett's Peerage. The pdf is of very bad quality. Some pages are barely readable. Very disappointed. This title was added to our catalog on March 07, 2007.